View More In Teapot Trivets. Made of solid wood with padding on back that protects your furniture. 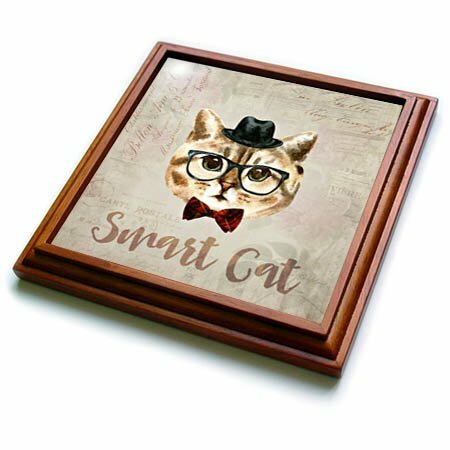 Framed trivet comes with 8 x 8 inches ceramic gloss tile attached to the wood frame. 3dRose trv_271212_1 Blue and White Flower Pattern Trivet with Tile, 8 by 8"
3dRose trv_269740_1 Pineapple Vector Trivet with Tile, 8 by 8"
3dRose trv_266221_1 Watercolor Cat Pet Kitten Animal Friend Funny Trivet with Tile, 8 by 8"
3dRose trv_253912_1 Stand Tall Wear a Crown and Be Sweet, Pineapple Picture Trivet with Tile, 8 by 8"
3dRose trv_276315_1 Surreal Digital Art of Eiffel Tower in Paris Trivet with Tile, 8 by 8"
3dRose trv_252963_1 Watercolor Forest Trivet with Tile, 8 by 8"
3dRose trv_276010_1 Red Tulip Trivet with Tile, 8 by 8"